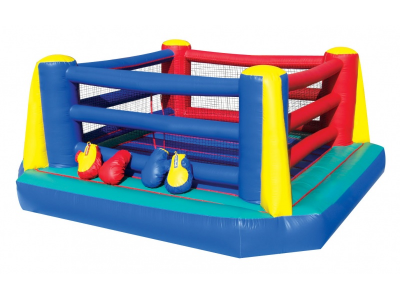 The Ultimate Boxing Ring Inflatable is the perfect inflatable sports interactive challenge for almost all ages. Kids square off against an opponent MMA-style for a fun romp while trying to keep their balance. It’s as safe as MMA boxing can be.This inflatable game fits great for competitive sporting events where users can show their skills and footwork. Make this a hit at your next kid’s birthday party. They’ll be talking about it for years. THIS INFLATABLE IS SUITABLE FOR AGES 8 - 16 YEARS. $300 FOR 4HRS OR $330 ALL DAY.